Artifact container associations connect service providers with consumers. An artifact container includes a set of artifacts and capabilities specified by a service provider. Artifact containers are often the unit of access control and version management. The CE tools use project areas as artifact containers, each tool managing different artifacts and links between artifacts. The Watson IoT platform uses organizations as the artifact container. Choose the appropriate artifact container association for the tool and links you want to use to connect CE artifacts with Watson IoT Platform artifacts. Associate the connector with each CE application you will use it with. In each application, go to Manage Project Areas. Note: Continuous engineering applications can be Change Management, Quality Management, or DOORS Next Generation. On the Application Administration page, from the Active Project Areas list, click a project area to configure. Scroll to the Associations section; then click Add. From the Application list, select the target connector application to link to. From the Association list, select the connector association. In the Artifact Containers section, select the project area that the connector links to, and then click OK.
Use the following table to find the supported associations and links for each application. Click OK to close the Add Association dialog box. In Rational Engineering Lifecycle Manager, custom artifact elements gather artifacts of a specific type based on a SPARQL query, and show them in view containers. View authors can use custom artifact elements to build views. To work with IoT Platform artifacts in views, you must import the custom artifact element into your Rational Engineering Lifecycle Manager project area. You must have a license for IBM Rational Engineering Lifecycle Manager version 6.0.5 or later. You must set up the server. You must have a project area, with assigned users and roles. 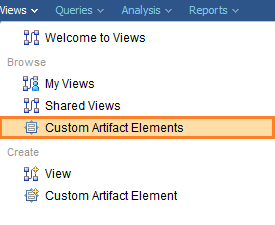 In your Rational Engineering Lifecycle Manager project area, go to Views > Browse > Custom Artifact Elements. Click the import icon to import the IoT Platform artifact element. Browse to the folder where you extracted the content of the installation package archive, and select the RELM_CAE_DeviceType.zip file. Note: You must add the IoT Platform custom artifact element to each Rational Engineering Lifecycle Manager project area that will show IoT Platform artifacts in views. Lifecycle management of IoT artifacts is not that different from dealing with analysis, design or implementation artifacts produced by CE applications such as IBM Rational DOORS Next Generation, IBM Rational Rhapsody, IBM Rational Team Concert, IBM Rational Quality Manager. You can use Continuous Engineering Lifecycle Management capabilities to facilitate the design, development, and implementation of your Watson IoT Platform applications. You can also use these capabilities in an embedded software development to deploy solution components to the Watson IoT Platform. This way you can expand the scope of traditional Systems and Software Engineering (SSE) solutions to the IoT. 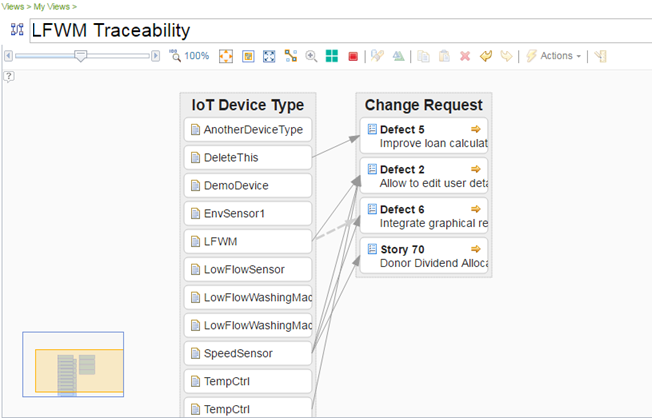 The CE Connector for IoT provides Open Services for Lifecycle Collaboration (OSLC) creation and selection dialogs for Watson IoT Platform artifacts as OSLC Change Management artifacts. You can link IoT Platform artifacts to any other OSLC provider that supports links to Change Management (CCM) artifacts. Various OSLC domain specifications define standard links to Change Management artifacts. These properties are supported by the products that are part of the IBM Continuous Engineering Solution. You can create links from IoT Platform artifacts to requirements, change requests (or any IBM Rational Team Concert work item type), and so on. When you create a link to an IoT Platform artifact, the selection dialog of the connector lists the possible target elements to link to. For example, if you are viewing a requirement in Rational DOORS Next Generation, you can create a References link to one or more IoT platform artifacts. You can search for the IoT Platform artifacts based on their names or type * or . * to show all artifacts. 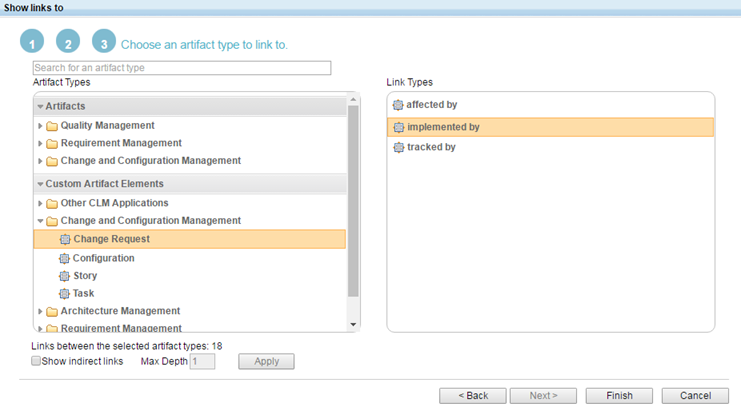 You can also select multiple artifacts to create several links in a single operation. After you create links between CE artifacts, including IoT Platform artifacts, OSLC consumer applications can use OSLC preview to show artifacts managed by other tools. For example, if you created a References link from a requirement to an IoT Platform artifact Low Flow Washing Machine (represented as LFWM), Rational DOORS Next Generation shows a preview of the LFWM device type. Hover over the link to see it. Note: You can also click Show more at the bottom of the window to see more details. The preview makes it easy to view linked artifacts across tools in order to understand their relationships. To open the artifact in the tool in which it was created, click the artifact. If you click an IoT Platform artifact, you see it directly on the Watson IoT Platform dashboard. Managing change is one of the main purposes of the IBM Continuous Engineering Solution. It facilitates collaborative interaction across multiple teams and across the whole solution delivery lifecycle to maximize the positive impact of change while minimizing its negative effects. The primary means of managing change is through comprehensive impact analysis across the lifecycle. The IoT Continuous Engineering Solution provides several ways to manage change, from fine-grained impact analysis in individual tools, to comprehensive impact analysis across tools by using Rational Engineering Lifecycle Manager. Individual tools often provide their own fine-grained traceability and impact analysis capabilities. In these tools, impact analysis extends only to the "edge" of the tool. That is, the tool can show traceability among its own artifacts, and links to artifacts in other tools. However, you cannot navigate beyond these links into the tool where the artifact resides. With Rational Engineering Lifecycle Manager you unlock the data from the CE applications, and perform impact analysis across tools. Each individual tool provides additional details that support a richer impact analysis of change. In Rational Engineering Lifecycle Manager you can create views that span across CE applications in order to perform system-wide, full lifecycle traceability and impact analysis. 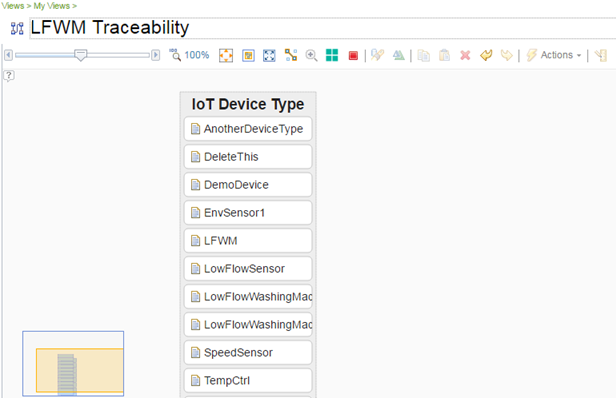 By using the CE Connector for IoT, you can include your IoT Platform artifacts in Rational Engineering Lifecycle Manager to gain a design-centered perspective on traceability and impact analysis. You can look at potential changes in your solution design and determine what requirements and test cases might be impacted. You can also assess the impact that changes in requirements might have on IoT Platform artifacts. Version 6.0.5.1 comes with the "Device Type" custom artifact element, which is a Watson IoT Platform artifact type. See Import the IoT Platform custom artifact element. You can create many types of views. The following example shows how to use the IoT Platform custom artifact element that you imported, to create a traceability view. On the menu select Views > Create > View. In the Create a view dialog box type the View name (the example uses the name LFWM Traceability), Change Request Analysis, and click Finish. To add artifacts, on the Palette expand the Custom Artifact Elements and drag the Device Type custom artifact element onto the canvas. In the Set Parameters dialog box, set different parameters to filter the artifacts in the container, and click OK. Note: If you don't select any parameters, the container shows all artifacts. Right-click the container, and click Show links to to open the wizard. 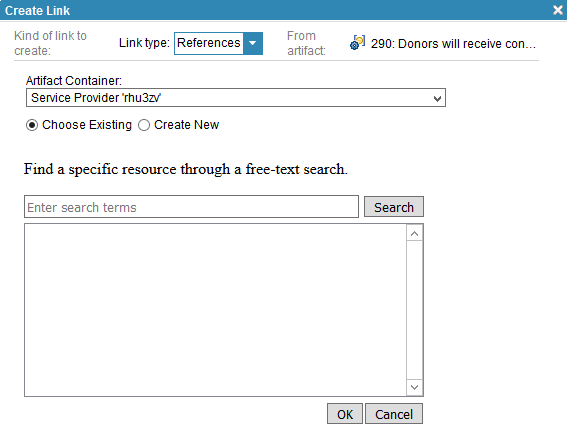 Use the wizard the create links to a new container by selecting the artifact and link types, and click Finish. Repeat steps 5 and 6 to link to more containers, and then click Save. From the IoT Device Type container artifacts, select LFWM. On the views toolbar, click Dependency Analysis, and select Downstream to apply Downstream dependency analysis to the view. For product documentation, see Rational Engineering Lifecycle Manager on the IBM Knowledge Center.